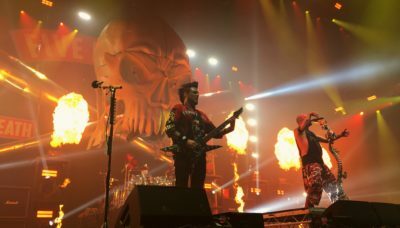 One of the most hyped metal shows of the year took its final stop in London’s SSE arena, and the anticipation reaches all the way to the tube station. The last time I walked through atmosphere like this was in 2013, when I saw Five Finger Death Punch support Avenged Sevenfold at the same venue. They completely outshone the headliners with their energy and stunningly brutal, yet charmingly melodic songs. 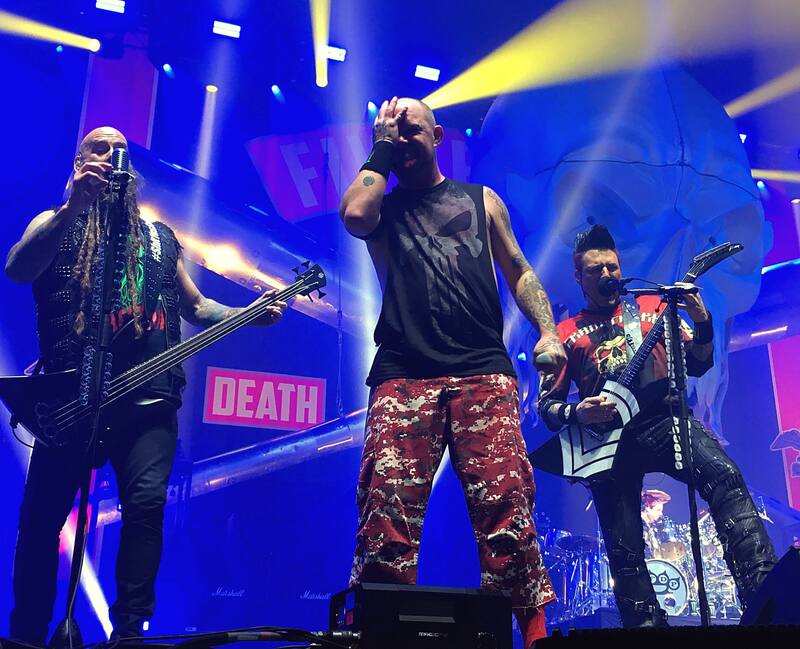 In the few years that have passed, FFDP have released another 2 critically acclaimed albums and have rose straight to the top of the metal scene. While tonight is sort of billed as a co-headline tour, everyone in the crowd was well aware that 90% of the audience are waiting for Ivan and co. to take to the stage. For an opening band, Of Mice And Men attract an full sized crowd, with brutal mosh pits opening from the word ‘go’ (which, ironically, is screamed multiple times by lead singer Aaron Pauley’). Their already firmly established fan base makes sure the band know they’re there, and those who are waiting patiently still join in the festivities. One Jesus-type figure even took to dictating an almost ritualistic circle pit and, drenched in his (and probably some of everyone else’s) sweat, walked through his creation before the brutal drop of ‘Public Service Announcement’ tore him from his feet. In Flames open their set behind a large, slightly translucent curtain. I still don’t really understand why. It crumbles to the floor after the first track, meaning I can now focus on the brutality. After Anders Friden’s slightly passive aggressive request for the audience not to spend the entire show on their phones, the familiar opening blast beats of ‘Take This Life’ ring over the audience. This is the only song in common between this show, and the last time I saw In Flames, back in 2011. It’s safe to say that despite Friden’s simple declaration that ‘we are old’, they haven’t lost their youth. Their ability to control the crowd and deliver track after track of brutality without a dip in quality is impressive. 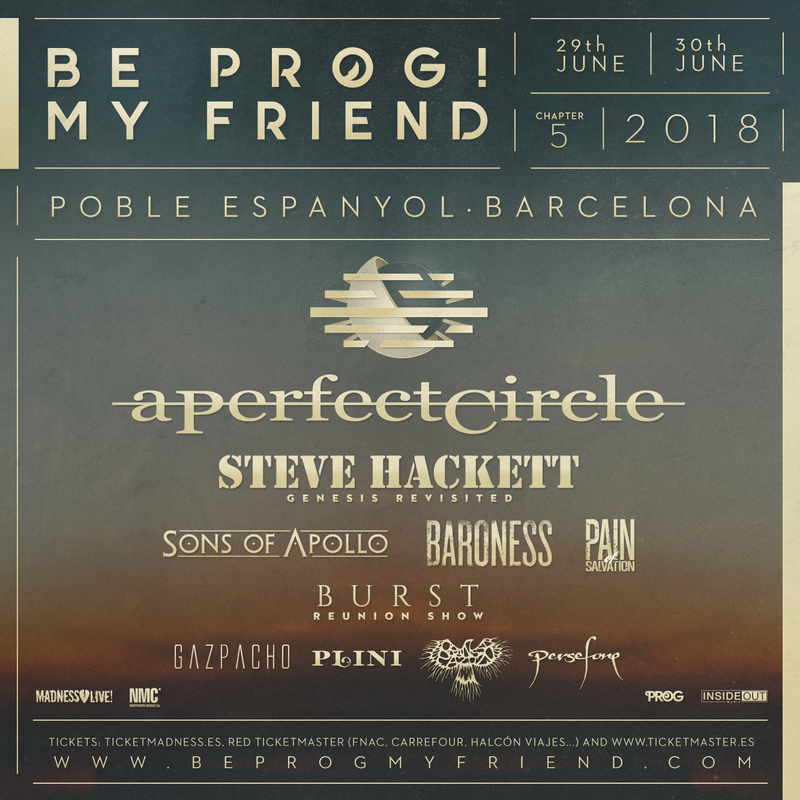 While we get the expected ‘Alias’, (which is met with enthusiastic cheers) the choice to base the vast majority of their material around their 2016 release ‘Battles’ is a strange one. Piercing tracks such as ‘Cloud Connected’ and my personal favourite ‘Deliver Us’ are missing, as is any acknowledgement of their 90’s death metal. It makes for a disappointing realisation when their almost hour-long set begins to draw to a close. However, no one else seemed to realise this, as the energy of both the band and crowd doesn’t dip at any moment, with circle pits and some sort of bizarre boat-rowing crowd situation which left me just as confused as the band dominating the hour. 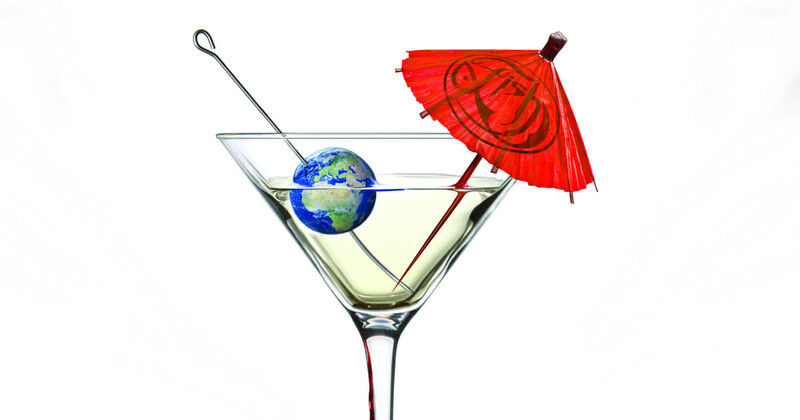 ‘The End’ aptly summarises a show full of genuine energy and excitement. 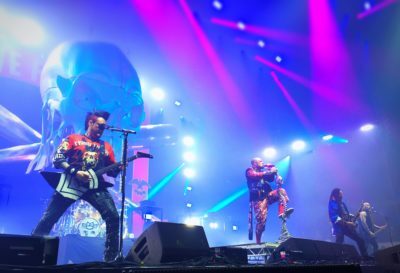 As the time slowly creeps past 9:30pm, the knowledge of the 11pm curfew starts to sink in, with people questioning the length of the Five FInger Death Punch set just as much as the time of the train home. As 10pm fast approaches, the lights dim and the attention is firmly back on stage, where a projection is playing on the, this time firmly opaque, curtain. I could see Ivan enter from the side of the stage, forcing himself to writhe and shake, possibly to try to induce as much anger as he can before belting out his anthems of hate. ‘Lift Me Up’ opens the show to roars of appreciation, but the effervescent hope that Rob Halford would come out to sing his verse was never quenched. 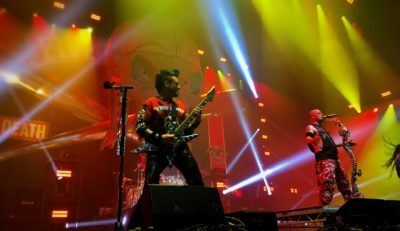 The band individually prowl the stage sporting shirts with their own band name on, with the menacing power of Chris Kael and his majestic dreadlocked beard contrasting the bouncy smile of Zoltan Bathory (who’s life I feel has been hugely enriched by having the single greatest name of all time). 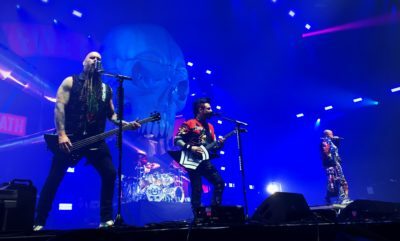 Jason Hook’s guitar glows green with what seems to be the same material from the bottom of kids light up shoes during his solos on ‘Lift Me Up’ and ‘Never Enough’, while Ivan Moody’s joking and passion is a joy to witness. After a year of breakdowns, rehab and stand in singer Tommy Vext, seeing Ivan control the stage with ease again is perfect. He soon invites both Tommy Vext, who has stayed out on tour with them for this one moment, and Aaron Pauley on stage to belt out ‘Ain’t My Last Dance’. The look of genuine delight on their faces to be on stage with people who clearly inspire them is pretty great to see. ‘Earlier this year, I had a breakdown’, says Moody, which sparks an immediate chant of ‘Ivan!’ from the crowd while he thanks Tommy Vext and explains the story everyone is all too aware of. Soon enough, his words are drowned out by cheers of appreciation and support by his loyal fans, and the band ease into ‘Burn MF’. 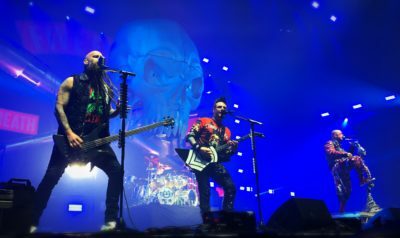 This FFDP live staple has its brutality ringing throughout the entire arena within seconds, and the call and response between the crowd sparks competition between the two sides. Apparently, Zoltan’s side won, but I’ll be vociferously refuting this all week. In contrast to the pure metal we’ve been treated to since half 7, the 3 track acoustic interlude is bold, but perfect. Everyone in the crowd knows every word, and if it wasn’t for the soaring vocal that replicates every studio recording so perfectly, Moody wouldn’t even need to be there. ‘Wrong Side Of Heaven’ is their biggest success story so far, and it’s no surprise, as even in its stripped down form the huge chorus completely overwhelms me again and again. Hook’s sarcastic ‘Stairway To Heaven’ is followed by Ivan leading a sing-song of ‘Champagne Supernova’ which shows that the band are capable of drifting away from their brutal, formulaic stage persona and having fun. Not long after this, Moody returns to the stage wielding a baseball bat. The theme of anger and aggression returns immediately as he bashes his mic stand for a while for some reason during ‘Under And Over It’. He ends up giving it to an older lady in a green jumper. Strange. The strangeness doesn’t end there, as they take about 3 minutes to gather around the drum kit and start signing stuff. ‘You don’t mind if we sign some stuff, right?’. Well I sort of do mind actually Ivan, because within the next 30 seconds he turns around to proclaim: ‘So apparently we have a curfew!’. After going on for at least a minute about how it costs £1000 for every minute over 11pm they go, they skip to their final song, ‘The Bleeding’. The lighters and phone lights come up, and the reminiscence and power of the 2007 track is felt across the 10,000 strong audience. It never, ever gets old. While the slightly bizarre and rushed ending leaves the gig tinged in bitterness, the band still seem happy. Moody thanks the crowd for the best show of the tour, Jason Hook gives a delighted thumbs up to my mate as we edge towards the door and my ears ring with both the repeated echoes of ‘why did they spend 3 minutes signing stuff on stage?’ and the sound of one of the best metal shows I’ve seen.